Blame my family ancestry for my fascination with the building of ships. My great grandfather and his son (my grandfather) were both riveters in the Harland and Wolff Shipyard in Belfast, N. Ireland. 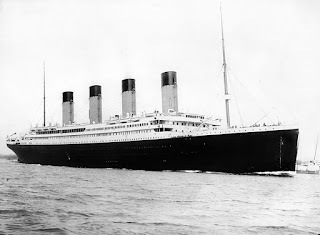 In fact, my paternal grandfather’s first ship when he started as a 14-year-old apprentice was the very ship that went down in 1912, yes…the RMS Titanic. As a family, however, we accept no responsibility for the sinking of that infamous vessel. Having a male ancestor who worked on the Titanic is not a rare thing for immigrants from N. Ireland, especially the city of Belfast. The majority of men in my grandparents’ era were employed by the world famous Harland and Wolff. To understand why one of Britain’s largest shipbuilders, both of passenger liners and naval vessels, was located in Belfast, you have to remember that the 6 counties in the north of Ireland have been a part of Great Britain for centuries and still are to this day. The remaining 26 counties of the island have made up the independent country of Ireland since 1922. The number of ships built in Belfast today is much fewer than during the golden years of shipbuilding, from about 1861 until the decline, around the mid-fifties when my father followed in the footsteps of his father and grandfather and joined the ranks of shipbuilders. In the late 1800’s there were up to 10,000 workmen, and around the time of the Titanic around 4000. I remember as a little child (I’m 58 now) being taken to the yard and staring up at the bow of an ocean liner sitting in dry dock. To this day the sight of the huge steel bows of ships arcing upward gives me the shivers, the scary shivers. My father’s first job at the yard was messenger boy. He was only about 16 at the time. With the yard being 300 square acres, he rode a bicycle with an attached leather saddle in which he delivered messages, blueprints, technical drawings, etc. from one point in to yard to another. Later he became a boilermaker and eventually immigrated to Canada in 1961, in the search of shipyard work as that trade began to die. An interesting note is; that might be the last great wave of Irish immigrants to the new world. But back in the day, Belfast was where hundreds of world-known leviathans were built for countries around the globe. They built 70 ships alone for the White Star line, aside from the Titanic and her sister ships Olympia and the Britannic. I always knew that one day I would write about the Belfast riveters who built these liners. Always a dangerous trade, 5 to 8 casualties a year in the shipyard was considered acceptable back when Titanic was launched. Thank God things have changed. But no doubt my grandfather and great grandfather stood on the shores of the River Lagan as the Titanic sailed out for her sea trials. Based on my research I wrote the following piece for my novel Sofi's Bridge that will be released May 1. This snippet shows the dangerous ballet of a riveter whether it be in shipbuilding or that of steel bridges. “Watching the riveter’s ballet of throwing white-hot steel always made Neil’s stomach harden to a lump. Neil picked out his brother, Jimmy, from among the men on the bridge deck, and expelled a long sigh. Working on those meager platforms hanging over the side, one slip, one fumble from that height...and a man could die. Like most people, I’m proud of my ancestry on both my mother and my father’s side. Those old family tales handed down from generation to generation fed my story-telling mind. Since Sofi's Bridge does not release until May 1, I am giving away an Ebook copy of any one of my already published novels (See titles in bio). To enter the giveaway of Christine Lindsay's novels leave a comment below. For extra entries share on FB, Twitter, Pinterest, and let me know what you shared. Christine Lindsay is the author of multi-award-winning Christian fiction. It was tales of her Irish ancestors who served in the British Cavalry in Colonial India that inspired her multi-award-winning series Twilight of the British Raj, Book 1 Shadowed in Silk, Book 2 Captured by Moonlight, and the explosive finale Veiled at Midnight. Christine’s Irish wit and her use of setting as a character is evident in her contemporary romance Londonderry Dreaming. Her upcoming release Sofi’s Bridge in May 1, 2016 also features a dashing Irish hero and was inspired by her paternal family history in the building of ships. For some reason ship building has fascinated me through the years. Thanks for this great inside look at those ship builders. I never realized what a dangerous job they had. Looking forward to the release of your new novel. Thank you Martha, it was a great topic to research. But then research is always more interesting when someone in your ancestry had that actual occupation. Oh Sharon, we have so much in common then. The last time I visited Belfast they were just starting to build the museum. However, I did get down to the shipyard and stood at the very slip that Titanic was moored. Fascinating. How interesting is that? I'd love to know more about my ancestors..An Uncle was writing a book on our family history but I don't know if he ever finished it.. I'm interested too in genealogy, but it's always been so expensive. It would be so interesting though, eh? I figure it's all good as long as we don't take ourselves or our genealogy too seriously. Blessings. Thank you so much Beth for the extra shares. This all goes into the hat for the drawing as extra entries. You have such rich history! I have a couple of family members that are tracing the family tree. Thank you Caryl, it's been an interesting family history for sure. On my mother's side is the inspiration for my historical trilogy Twilight of the British Raj. Thank you Michelle, it's definitely a research topic close to my heart. Your family tree is rich in history. Love family history. Great article Christine. Hi Betti, thanks so much for leaving a comment. Your name is going in the draw. Blessings. Interesting post! My yet-to-be-published novel is based on a real Titanic passenger, and I'm always excited to find anything about the ship and its history. Thanks for sharing, and I'll look forward to reading your books! So exciting for you Peggy, enjoy your Titanic research. Really enjoyed the background knowledge you shared on the subject of shipbuilding. All the primitive know how compared to today's world. Thank you Melody. I too love to read about that primitive know how, so different from today. Congratulations, and the winner is Beth S. I will contact Beth through her email and let her choose which one of my already published books she would like to read. Thank you all for dropping by and commenting. Blessings on each and every one.